Honor, hard work, and faith are the three main lessons you can learn from this uplifting movie about a struggling rookie golfer and his journey in Utopia. With a population of 373 (or rather 375 because someone in the town just had twins), a small town can bring big inspiration for the whole family. 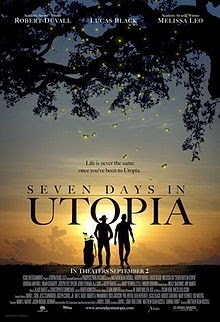 When you put together a hotheaded golfer who recently suffered a widely publicised meltdown (Luke Chisholm played by Lucas Black) and a retired pro golfer living in the small town of Utopia (Johnny Crawford played by Robert Duvall), you get a well-told tale of self-discovery and faith. Luke’s troubles begin long before he crashes into the fence of a small town ranch. The pressure he has felt from his father to succeed as a golfer becomes the reason why he lost faith in himself and his game. All this changes the moment Johnny takes him under his wing and utters “Spend seven days in Utopia, and you’ll find your game”. It’s through Johnny’s profound outlook on life, love, and faith that makes Luke realise how his actions in the past weren’t exactly appropriate, and he soon comes to terms with the real path he has to take for his future. Just like Luke Chisholm in the movie, you will be able to appreciate life in a small town. The values and their way of looking at life are refreshing and inspiring. The way Matt Russell, the director of the movie chose to end it was a twist of real genius and that will leave the viewer uplifted. Instead of reading about the ending in spoilers, why not take the time to watch this very beautifully shot movie through free online movie streaming? We’ll guarantee that you’ll also cherish the time you’ll spend in the green fields of Utopia. Can Films Prepare You for the Rise of the Undead? Dissecting Cults… Not That Kind of Cult! Life Out There… or Is It?